Aliens living on distant planets may be trapped there by gravity, according to new research. Scientists looked into how difficult it would be to launch a rocket from a super-Earth - huge worlds up to ten times the size of our own. A large number appear to fall within the 'Goldilocks zone' of their star, a region in which the planet's surface temperature is 'just right' to support alien life. 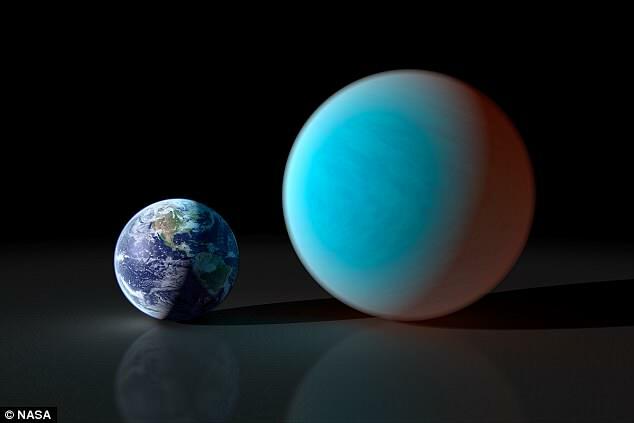 Researchers calculated that the gravitational pull of a super-Earth means it would be almost impossible to launch a spacecraft from the huge planets. To fire the equivalent of an Apollo moon mission into orbit, a rocket would need a mass of around 440,000 tons (400,000 metric tons) - equivalent to Egypt's Great Pyramid of Giza - due to fuel requirements, research found. This means that alien civilisations on super-Earths would need to use rockets that don't rely on chemical fuel to get into space, researchers said. 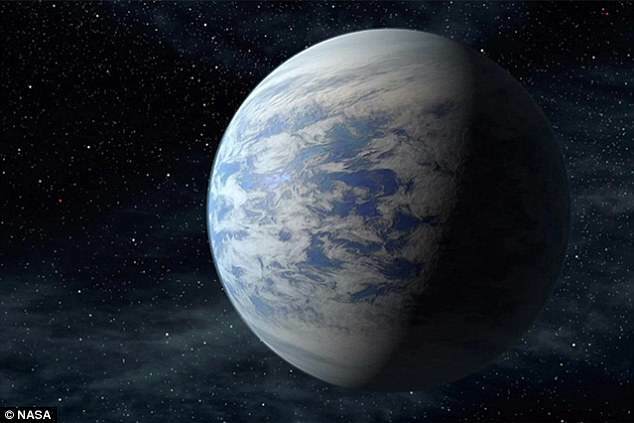 'Many rocky exoplanets are heavier and larger than the Earth, and have higher surface gravity,' study author Michael Hippke, an independent researcher affiliated with the Sonneberg Observatory in Germany, told Space.com. 'This makes space-flight on these worlds very challenging, because the required fuel mass for a given payload is an exponential function of planetary surface gravity. 'On more-massive planets, spaceflight would be exponentially more expensive. The gravitational pull of the Earth can be defeated with huge rockets that produce incredible amounts of thrust. Two separate papers investigated if it would be possible to even create a rocket powerful enough to overcome this huge pull of distant 'super-Earths'. 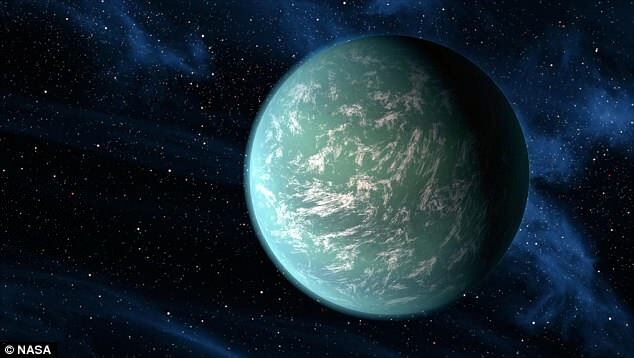 Many of these exoplanets lie in regions around distant stars where it may be possible to maintain liquid water and an atmosphere, both believed to be essential for life. In his paper, Mr Hippke investigated how difficult it would be to launch a rocket on a hypothetical super-Earth that was 70 per cent wider than our planet and 10 times more massive. As it happens, they are roughly the same dimensions and the alien planet Kepler-20b, which is about 950 light-years from Earth. On this 'planet', he found that the escape velocity needed would be 2.4 times greater than on Earth. The escape velocity on Earth is around 25,000 mph (40,000 km/h). The habitable zone is the range of orbits around a star in which a planet can support liquid water. This habitable zone is also known as the ‘Goldilocks’ zone, taken from the children’s fairy tale. The temperature from the star needs to be 'just right' so that liquid water can exist on the surface. The boundaries of the habitable zone are critical. If a planet is too close to its star, it will experience a runaway greenhouse gas effect, like Venus. But if it's too far, any water will freeze, as is seen on Mars. Since the concept was first presented in 1953, many stars have been shown to have a Goldilocks area, and some of them have one or several planets in this zone, like 'Kepler-186f', discovered in 2014. 'Civilisations from super-Earths are much less likely to explore the stars,' Mr Hippke said. To counteract the huge gravity, the proposed extraterrestrials may decide to use mountain tops as a launch base. The issue with this idea is that the huge gravity will severely limit the height that mountains can grow to. Although the gravitational pull makes leaving the planet difficult, the extra attraction may provide benefits for nurturing and protecting life. It would pull down gases and produce 'a thicker atmosphere, and thus better shielding for life on the surface against harmful cosmic rays,' according to the paper. Whilst this is all theoretical, it doesn't mean that aliens would not be capable of space exploration, they would just likely devise very different methods than humans have. With chemical propulsion unlikely to provide enough thrust, the alien equivalent of Nasa may utilise nuclear-powered spacecraft. In a second paper, Dr Abraham Loeb from Harvard University published similar findings. He explained how nuclear-powered spaceflight might be achieved by by aliens on a large, rocky planet in order to overcome its strong gravitational pull. Dr Loeb said: 'An advanced extraterrestrial civilisation could use other propulsion methods, such as nuclear engines or lightsails which are not constrained by the same limitations as chemical propulsion and can reach speeds as high as a tenth of the speed of light. WHAT ARE THE KEY DISCOVERIES HUMANITY HAS MADE IN ITS SEARCH FOR ALIEN LIFE? British astronomer Dame Jocelyn Bell Burnell was the first person to discover a pulsar in 1967 when she spotted a radio pulsar. Since then other types of pulsars that emit x-rays and gamma rays have also been spotted. Pulsars are essentially rotating, highly magnatised neutron stars but when they were first discovered it was believed they could come from aliens. 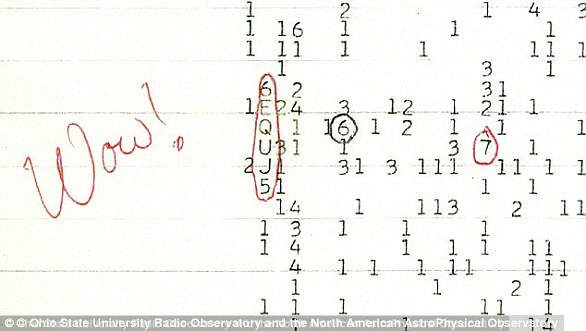 In 1977, an astronomer looking for alien life in the nigh sky above Ohio spotted a powerful radio signal so strong that he excitedly wrote 'Wow!' next to his data. The 72-second blast, spotted by Dr Jerry Ehman through a radio telescope, came from Sagittarius but matched no known celestial object. Conspiracy theorists have since claimed that the 'Wow! signal', which was 30 times stronger than background radiation, was a message from intelligent extraterrestrials. In 1996 Nasa and the White House made the explosive announcement that the rock contained traces of Martian bugs. The meteorite, catalogued as Allen Hills (ALH) 84001, crashed onto the frozen wastes of Antarctica 13,000 years ago and was recovered in 1984. Photographs were released showing elongated segmented objects that appeared strikingly lifelike. However, the excitement did not last long. Other scientists questioned whether the meteorite samples were contaminated. 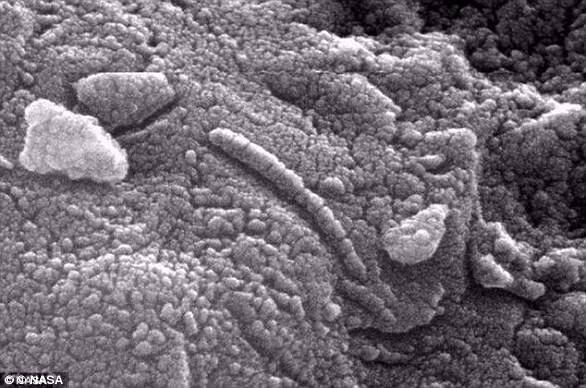 They also argued that heat generated when the rock was blasted into space may have created mineral structures that could be mistaken for microfossils. The star, otherwise known as KIC 8462852, is located 1,400 light years away and has baffled astonomers since being discovered in 2015. It dims at a much faster rate than other stars, which some experts have suggested is a sign of aliens harnessing the energy of a star. 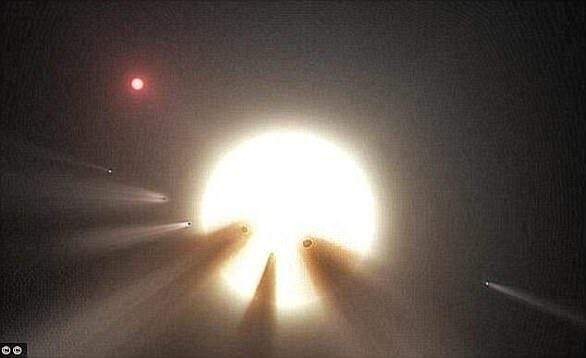 Recent studies have 'eliminated the possibility of an alien megastructure', and instead, suggests that a ring of dust could be causing the strange signals. In February this year astronomers announced they had spotted a star system with planets that could support life just 39 light years away. Seven Earth-like planets were discovered orbiting nearby dwarf star 'Trappist-1', and all of them could have water at their surface, one of the key components of life. Three of the planets have such good conditions, that scientists say life may have already evolved on them.